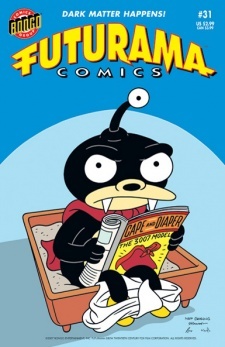 "As the Wormhole Turns" is the thirty-first comic issue, which was released 26 May, 2007 in the US. Leela takes Nibbler to see the vet and discovers he has worms. Due to his production of dark matter fuel, the worms adapt to create wormholes, so the vet prescribes him pills to get rid of them. However the Professor and Hermes realize that they can now walk through the wormholes to planets, saving them money on starship fuel, so they replace Nibbler's pills with mints. The wormholes start to attract tourism and illegal immigrants so Richard Nixon puts Zoidberg in charge of immigration. Although the registration results in large lines, Zoidberg and Bender start to accept bribes. People start to protest about the immigrants until Bender shows the supermodels who have immigrated. An alien species called Tauronians start to conquer Earth, so Fry and Leela convince the Omicronians along with other alien species to invade Earth so fighting over it would turn Earth into an ash planet and would put them off invading. Instead they decide there's nothing wrong with an ash planet and all the immigrants leave Earth because they don't want to live on an ash planet. Hermes brings out forms which the aliens need to fill out in order to invade Earth, with promise of contacting them when the processing is done. Thanks to the Central Bureaucracy this will take about 600 years. Richard Nixon's head: Unfortunately, we have no more money in the budget for a border patrol. I spent it all on jowl wax. Bender: So you don't want any more immigrants? Bender: Well that's too bad because we just got some from a planet of supermodels. Come on out! Alien immigrants to Earth included Fnog, who was thought to already be here, and others such as Cyborg, Seven of Nine, Marvin the Martian and Donald Duck.